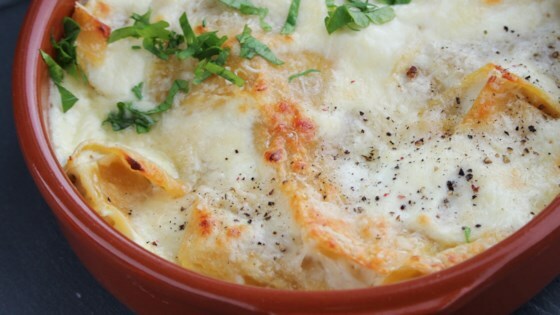 "Fast, fresh individually portioned lasagna bowls that please the stomach every time. I serve this with a small garden side salad and baked asparagus, but it easily could be a meal by itself." Preheat the oven to 450 degrees F (230 degrees C). Grease four 8-ounce ramekins with 1 tablespoon olive oil. Bring a large pot of lightly salted water to a boil. Cook lasagna noodles in the boiling water, stirring occasionally until tender yet firm to the bite, about 8 minutes. Drain. Mix together drained noodles, ricotta cheese, mozzarella cheese, 1/2 cup Pecorino Romano cheese, and 1 1/2 teaspoons pepper in a bowl. Divide mixture among the ramekins. Top with 2 tablespoons Pecorino Romano cheese, drizzle with 1 tablespoon olive oil, and sprinkle with remaining 1/2 teaspoon black pepper. Bake in the preheated oven until cheese is golden brown in spots and lasagna is heated through, about 10 minutes. Garnish with parsley and paprika, if desired. Very good!! Kids ate every bite! Loved it! I love lasagna, but my boyfriend isn't as crazy about it. This doesn't require sauce and it is easy.